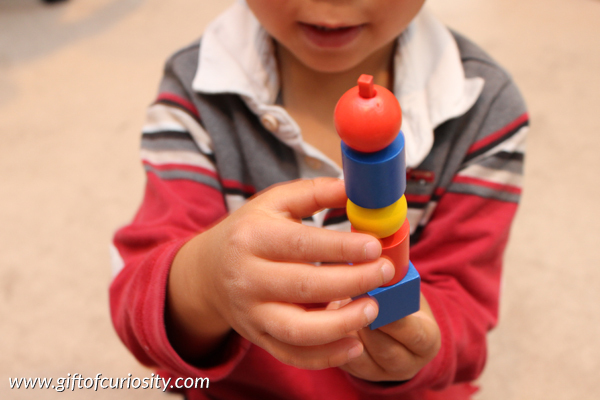 My kids have been familiar with 2-dimensional shapes for quite a while, but we really haven’t spent much time learning about 3-dimensional shapes. On a recent morning, I decided to change that. 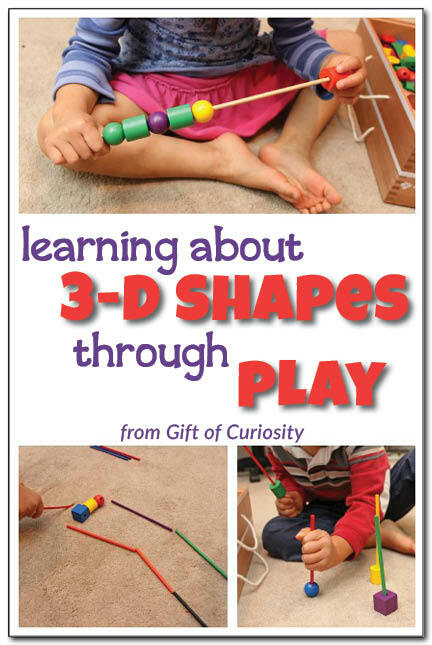 🙂 But I wanted to come up with activities to teach 3-D shapes in fun and playful ways. Fortunately, there were some great ideas in our Spielgaben curriculum materials that we used to get started. 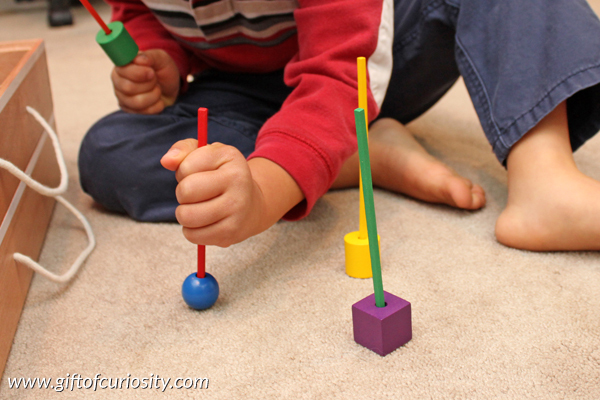 And once we started playing with 3-D shapes, it seemed that I just kept coming up with more and more new activities! 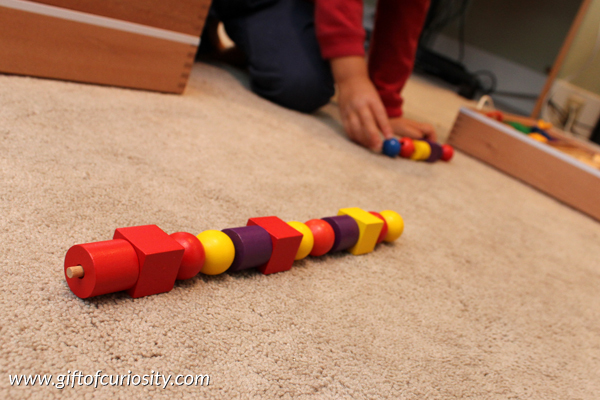 But do you want to know the best part about our experience playing with 3-D shapes? My kids and I had a total BLAST while learning and playing together! 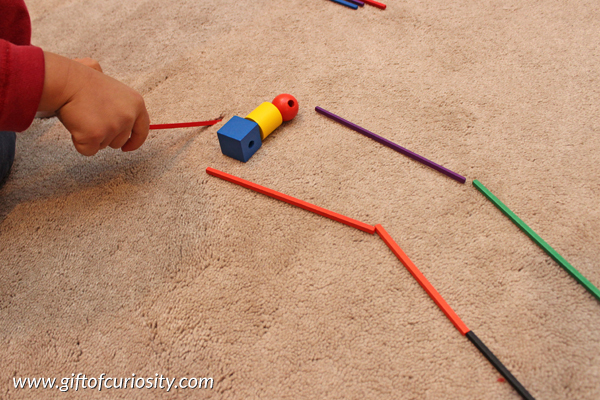 One of the ideas in our Spielgaben materials suggested using 3-D shapes to make patterns. I started by doing a 3-period lesson with my kids to familiarize them with each of these three shapes. 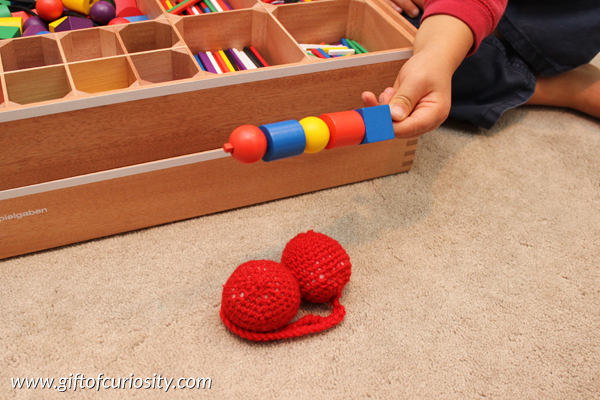 Then I skewered a pattern that included a cylinder, cube, and two spheres onto the wooden sticks in our Spielgaben set. After my kids had copied my pattern a few times, I changed up the activity to keep it interesting for them. 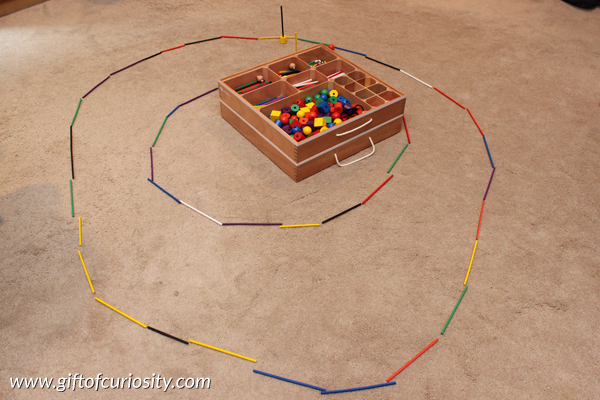 (This next idea also came from our Spielgaben curriculum materials.) We decided to make “kebabs,” but instead of putting food on our stakes, we decided to put 3-D shapes instead. We all had fun selecting our shapes to put on our kebabs. The kids were giggling as they decided what kind of food each shape represented. I then set up two of the red balls from our Spielgaben set as a “campfire.” We took turns roasting our kebabs over the fire and then eating them. Yum! After this, I came up with an idea to help my kids focus on the qualities of each shape, with a focus on whether the shape had flat or curved sides. 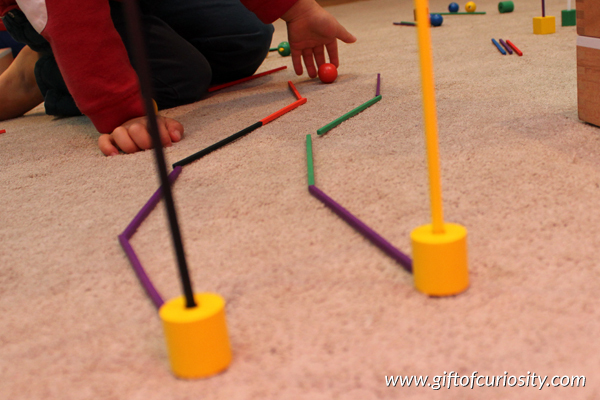 I invited my kids to poke some tall sticks into the hole in each shape in order to get the sticks to stand up. 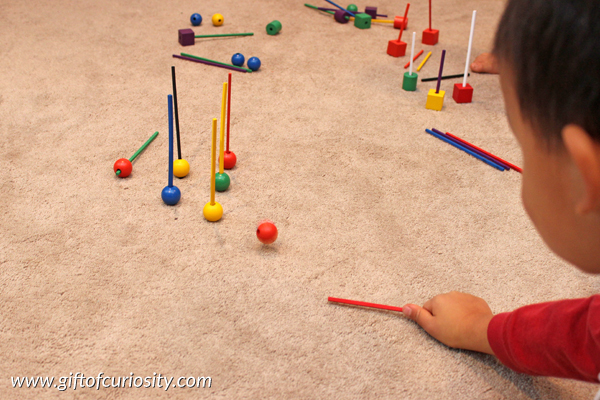 I then encouraged my kids to try blowing the sticks over. They discovered that it was much easier to blow over the stick stuck in the sphere than the sticks stuck in the cylinder or cube. This discovery lead to a brief discussion about the type of sides on each of the shapes. 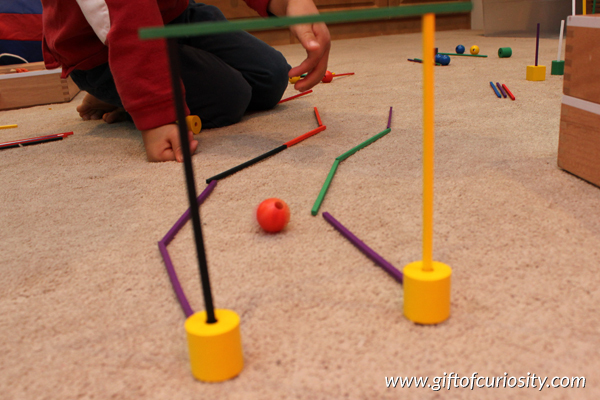 After blowing the shapes over, I realized that we could make our own bowling pins using sticks stuck into the spheres! So we set up a game of 10-pin on the carpet. 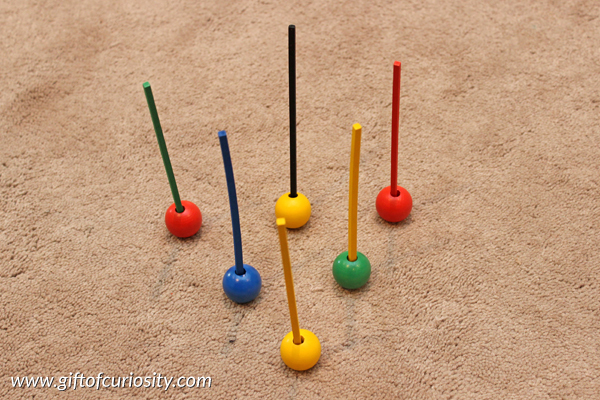 I invited my kids to “bowl” by pushing a sphere with a stick into the pins. Boy did my kids have a blast with this! Once we were done bowling, I set up a course for them. 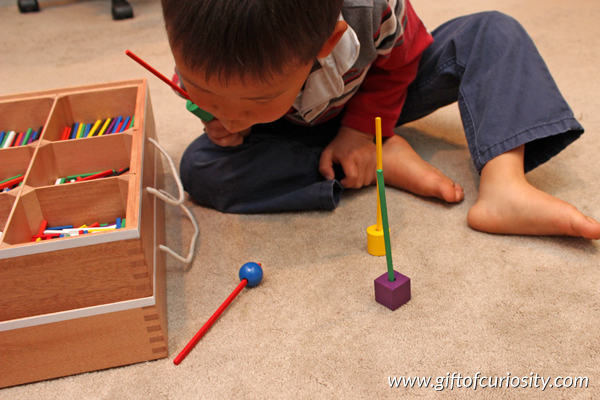 I gave my kids three different shapes – a cube, a cylinder, and a sphere – and invited them to push the shape through the course to the finish line. 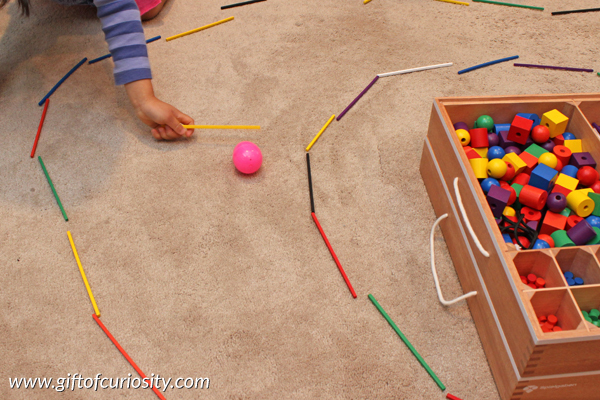 My goal here was for my kids to compare – through play – how a cube, cylinder, and sphere roll. Not surprisingly, my kids discovered that it was easier to roll a sphere through the course than any of the other shapes. 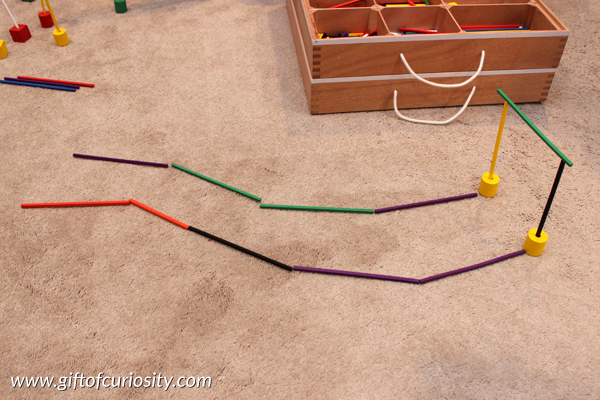 Inspired by the little mini course I had set up, QBoy decided to make a much bigger race track for all three of us to play on. I didn’t get a lot of pictures, since I was too busy playing, but I did capture this one of XGirl trying to roll an ovoid (in the form of a plastic Easter egg) around the course. All three of us had so. much. fun. playing with 3-D shapes on this day. I surprised even myself with how many different activities to teach 3-D shapes we ended up enjoying together. Even though my kids didn’t realize it, as they played they were learning the properties of these 3-D shapes, which means that my goal for the morning was accomplished. This looks like so much fun! I’m featuring you on this week’s Hearts for Home post.